Handbags, even more than shoes, (I know! ), are one of my biggest passions, so I thought it might be a bit of fun to do a quick handbag version of my “Five iconic” series. Which kinda sounds a wee bit OTT really considering currently my “Five iconic” series consists of “Five iconic fragrances” and that’s it! But hey, I’m getting there – this blog is still but a baby! Anyway … back to the iconic handbags. These five bags are what are generally considered the most iconic handbags available … there are others of course, but these ones seem to come out on top in most polls. Though they’re numbered, they’re in no particular order. First launched in 1982 by Hermés, the Birkin bag is handmade by artisans in France in leather and is named after the actress and singer Jane Birkin. These bags are EXTREMELY expensive and are therefore a status symbol and very much in vogue with celebrities. They can range anywhere from $13K to to over $365K- actually, the sky’s the limit really! Hermés distribute these bags on an unpredictable schedule to their boutiques and in limited quantities – this creates scarcity and exclusivity – and the dreaded waiting list! They can be made to order and customers can choose different hides (calf leather, ostrich, crocodile, lizard – the most expensive being saltwater crocodile), colour and hardware fixtures – you can even have them diamond-encrusted – now that, is handy! They come in 25, 30, 35 and 40cm; the smaller-scale versions are generally more expensive. The Hermés Birkin is one of the most recognisable handbags EVER – despite being logo-free. 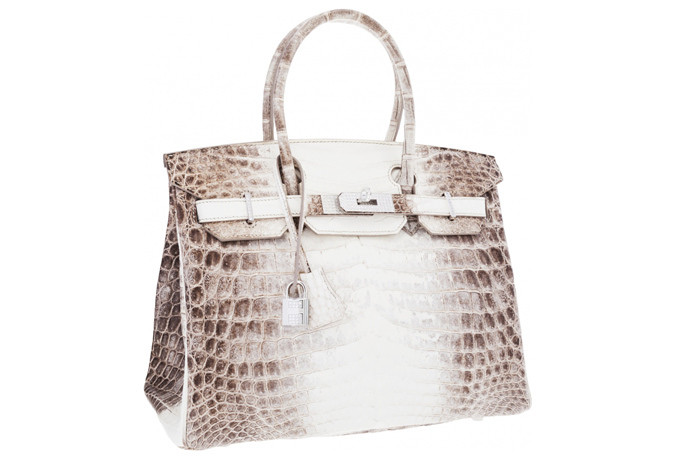 This particular Birkin is the extremely rare Himalayan Nilo Crocodile Birkin – encrusted with 245 diamonds, boasting 18-karat white gold hardware and crafted from extremely pale crocodile skin. It cost an eye-watering $365,000 – yes, that’s THREE-HUNDRED-AND-SIXTY-FIVE-THOUSAND-DOLLARS! Gosh! (FYI – Victoria Beckham has one – well she would, wouldn’t she?!) That makes the other handbags in this list seem cheap as chips! It was a bit of a toss-up between the Louis Vuitton Noé and the Speedy, to be honest, but I’ve chosen the Noé because it has a cooler history! When asked by a champagne producer to develop a sturdy, stylish bag in which he could transport five bottles of bubbly (four upright and one in the middle, upside down), Gaston-Louis Vuitton created the classic Noé design in 1932 – it is now one of the icons of the Louis Vuitton collection. They also now produce the Petit Noé – a smaller version. As with all of the iconic bags in the Louis Vuitton collection, the Noé is available in various materials; the first photo shows the Noé in the traditional and most popular, monogram pattern; below is the Noé in the beautiful and hardy epi leather. Which of these gorgeous shades would you choose? I’m very torn, but am leaning toward the mandarin colour (officially called Piment.) By the way … I am a HUGE fan of Louis Vuitton – just thought I’d throw that little fact in! The Noé retails for approximately $1,800 to $2,600, depending on the material used – told you they were cheap compared to the Hermés Birkins! As we all know, Coco Chanel was a woman far ahead of her time – as early as 1930 she had decided she didn’t want to have to carry her bag in her hand any more, so created a strap. Apparently she drew inspiration for the early models of her bags from the rucksacks of soldiers. 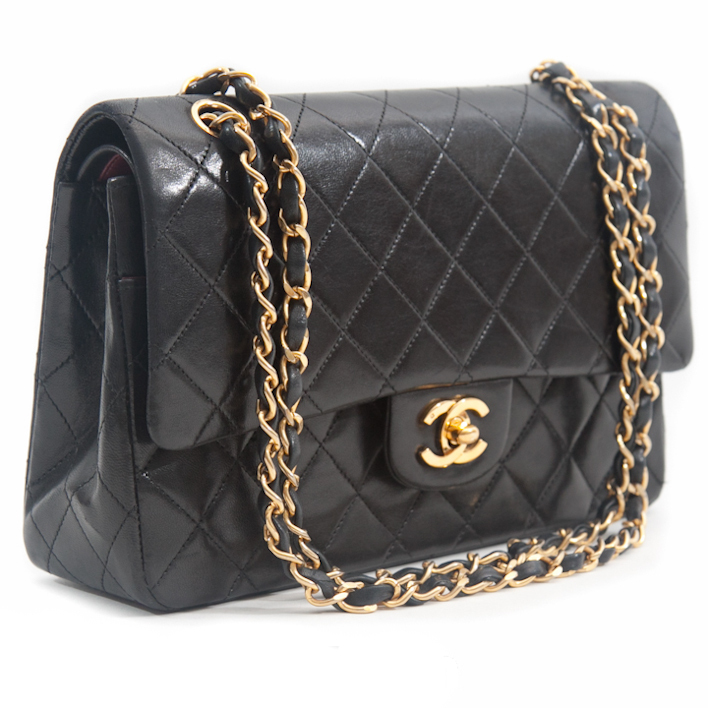 The flap bags reached the height of their popularity in 1955 with the introduction of the Chanel 2.55 Flap Bag. Fun fact: rumour has it that the bag’s zip compartment was used by Coco Chanel to hide her love letters! They’re pretty expensive, with a starting point of around $3,500 – but again, they’ve got nothing on the Birkin. I know, I know .. it’s another one from Hermés. 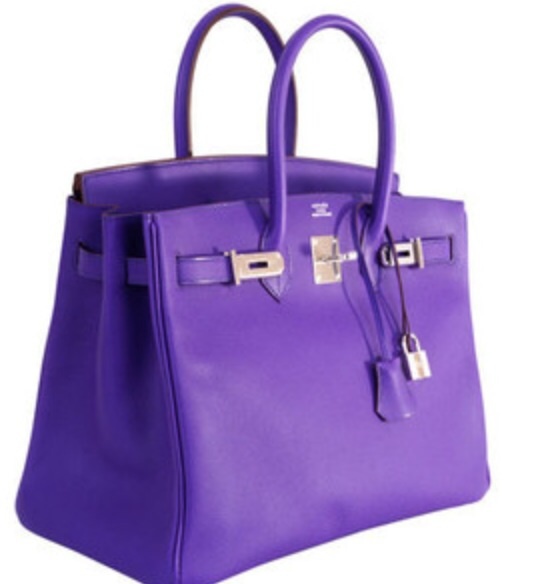 A little bit greedy of them really – but actually, the Kelly just is as iconic as the Birkin. The Kelly bag – you’ll never guess – is named after the one and only Grace Kelly (pictured above.) 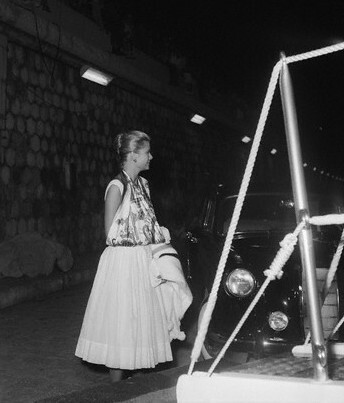 It became part of fashion history in 1956 when Grace, then Princess Grace of Monaco, attempted to protect her pregnant stomach from the prying cameras of the paparazzi by using her handbag as a shield. As you can see, the Kelly and the Birkin are very similar – the Kelly was released in the 50’s and the Birkin in the 80’s. As I mentioned earlier, all Hermés bags are handmade by artisans in France. Only one artisan at a time may work on a bag and a Kelly bag takes around 18 hours to hand-make. They retail from around $11,900 – eeek! Wonder if they offer an instalment plan?! 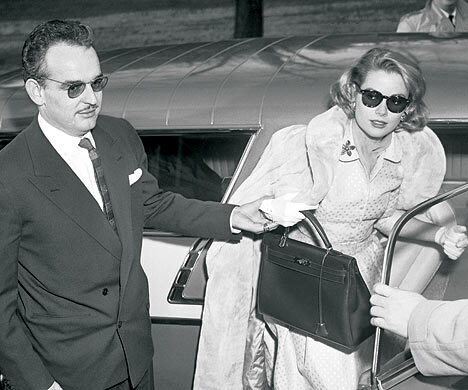 Fun fact: Grace Kelly once used an Hermés silk scarf as a sling for her broken arm. Why not I guess?! This one was popularised by the late Lady Diana – she was supposedly introduced to Dior’s line of handbags in 1995 by the First Lady of France at the time – Madam Chirac – who was also a big fan of this exclusive handbag. 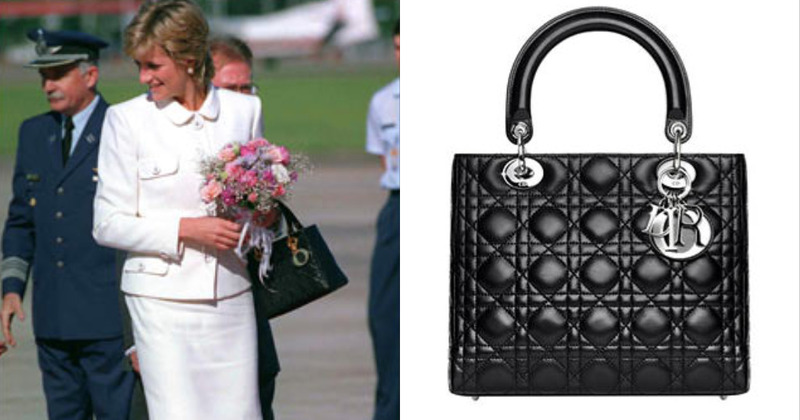 The bag soon became one of Lady Di’s favourite accessories and she wore it to many events, thus helping it make it’s mark as a symbol of class and sophistication. It is rumoured the bag is named after her – I’d like to think that’s correct. Who better to be the inspiration for such an elegant bag really? 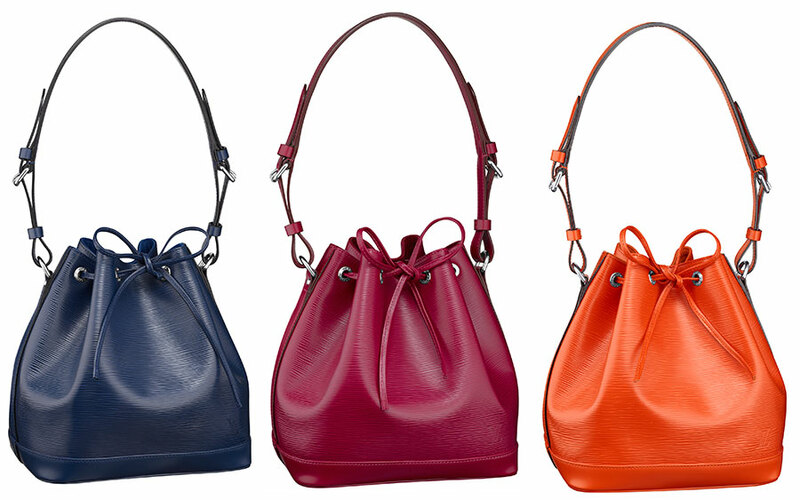 These bags are also handmade and feature the iconic Dior “cannage” stitching which enhances the lambskin leather. They start at around $3,500 and go upwards from there. What’s your favourite handbag? Have you scrimped and saved for a designer or a classic version, or don’t you care? Do you, like me, appreciate the heritage and glamour of these classic handbags? Posted on January 14, 2015 October 5, 2018 by MumptyStylePosted in Fashion, Mumpty StoriesTagged Birkin, Chanel, designer handbags, Dior, fashion, Grace Kelly, Hermes, Hermes Kelly, iconic handbags, Kelly, Lady Diana, Lady Dior, louis vuitton, LV, Noe, Petit Noe.